The Stanley Cup, originally called the Dominion Hockey Challenge Cup, is awarded each year by the National Hockey League to the champion of its playoff tournament. 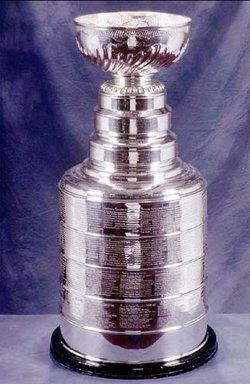 A unique feature of the Stanley Cup is the fact that, with few exceptions in the past, the Stanley Cup is the only trophy in professional sports that has the name of every member of the winning team engraved upon it. This has not always been the case - one of Lord Stanley's original conditions said that each team could, at their own expense, add a ring on the Cup to commemorate their Cup victory (the first year being an exception). Initially, there was only one ring, the one added by the Montreal AAA. Teams would engrave their names on that one ring until it was full in 1902, and with no room to engrave their names (perhaps unwilling to pay for a second band to the Cup), teams left their mark on the bowl itself, starting with the 1903 Montreal AAA and continuing to 1908. In particular, the 1907 Montreal Wanderers recorded their names inside the bowl's interior. In 1908, for reasons unknown, the Wanderers, despite having turned aside four challengers, did not record their names on the Cup. The next year saw the Ottawa Senators add a new band onto the Cup. Despite the new room on the Cup, the 1910 Wanderers and the 1911 Senators, for reasons unknown, did not put their names on the Cup. The new band would eventually be filled by the Vancouver Millionaires, who, although they did not properly win the Cup (which by then was a formal championship game akin to the World Series), they did win the league championship of the previous champion's league. It has also been noted that two other teams were on the Cup due to the "league championship" clause from 1915 to 1918, although they did not officially win the Cup. It was a mystery why no further engraving occurred until 1924, when the Canadiens added a new band on the Cup. However, since then, the engraving of the team and its players have been an annual tradition that has not been broken. In particular, a new band was added each year until the Cup was redesigned in 1948, causing the Cup to balloon in size from 16 inches (400 mm) tall in 1909 to almost three feet (900 mm) in height in 1940. The Cup was redesigned in 1948 as a two-piece cigar-shaped trophy with a removable bowl and collar. This Cup also properly honored those teams that did not engrave their names on the Cup themselves. The modern one-piece Cup design was introduced in 1958 with the replacement of the old barrel with a five-band barrel (each of which could contain 13 winning teams). Although the bands were originally designed to fill up during the Cup's centennial year, the names of the 1965 Montreal Canadiens were engraved over a larger area than allotted (and thus there are 12 teams on that band instead of 13). The bands were finally filled up in 1991 when a decision was made to preserve the top band of the large barrel in the Hockey Hall of Fame and introduce a new blank band at the bottom so that the size of the Stanley Cup would not grow further. In 2004, a second band replacement was needed. It is also to be noted that since 1958, the Cup underwent several minor alterations, namely the retirement of the collar in 1963 and the bowl in 1969 in favor of duplicate ones due to the originals being too brittle.